NDO – Vietnamese photographers Nguyen Huu Thong and Tran Tuan Viet have emerged triumphant at the 15th annual Smithsonian Photo Contest. Nguyen Huu Thong from Bac Giang province stood out from 60 finalists competing in the contest to win the Grand Prize worth US$2,500, for his photo ‘Bua Sang Tai Cho Phien’ (Breakfast at the Weekly Market). Thong revealed that the photo was taken accidentally in the morning at a rural market in the northern province of Ha Giang during the Tet (traditional lunar New Year) festival 2017. Sharing the background of the photo, Thong explained that in northern Vietnam, people come to the weekly market to exchange goods and culture. They usually wake up very early to go to the market and have breakfast there. 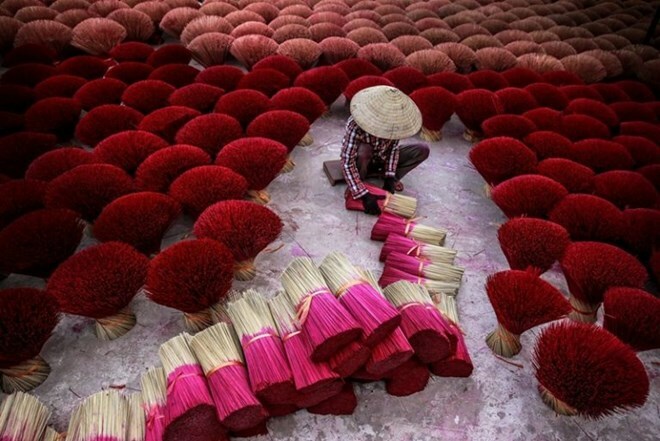 Meanwhile, the photo ‘Lam Huong’ (Making Incense) by Tran Tuan Viet from Hanoi won the contest’s Travel category. The photo captured decoratively dyed bundles of incense drying in Quang Phu Cau village, Ung Hoa district in Hanoi. Viet’s photo is one of the most-viewed images in the history of the photo contest, with more than 50,000 views so far. The two winning photos were among more than 48,000 entries submitted by photographers from 155 countries and territories from around the world, in six categories: The natural world, The American experience, Travel, People, Altered Images, and Mobile.